The first goal of the network was to save public dollars by eliminating leased lines from private providers. 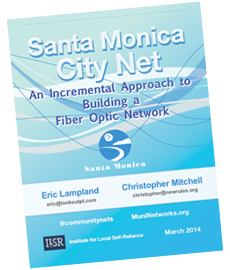 The first $530,000 investment in fiber infrastructure ultimately resulted in an ongoing savings of $700,000 per year. As part of their long term strategy, the City reinvested those savings in expanding the network. Over the past ten years, the network has expanded to offer dark fiber and services of 100 Mbps to 10 Gbps to area businesses as well as free Wi-Fi to the public in many areas. Money that could have been spent on leasing slower, less reliable connections from existing providers has instead been used to expand public infrastructure and other public amenities. Free Wi-Fi, public safety video cameras, and realtime parking info are just a few niceties that enhance the quality of life in Santa Monica. If you want to stay up to date with these kinds of stories, be sure to sign up for our Community Broadband Networks once-per-week email newsletter.